A Donegal seafood company is bringing a unique Irish species of tuna – Wild Irish Albacore Tuna – back into the country and selling it across the island. Shines Seafood, a family-run business located in Killybegs, is the only Irish company to source and sell the product in Ireland. After decades living and working in Ireland’s largest fishing port, it was the Shine family who discovered the delicious Albacore tuna while working with a Basque company. Fishermen catch some of the finest Albacore Tuna (Thunnus alaunga) off the coast of Ireland every year – some 2,583 tonnes in 2016 – but all of it was leaving the country. Shocked to discover that it was not available here, the family looked into sourcing it. 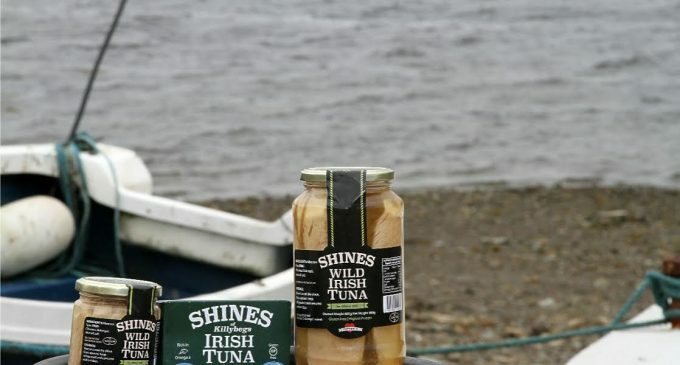 Husband and wife John and Marianne Shine launched Shines Seafood in April 2015 to bring Albacore tuna to the Irish retail sector for the first time. The company works with Irish fishermen to source the fish and, using the same company it previously worked with in the Basque Country, it packages the product in glass jars and tins under its own brand. The couple’s daughter Ciara, who was a participant on ACORNS, a government-run programme for female entrepreneurs in rural areas, is now also helping at the helm. The Shine family’s background has always been in fish. John worked as a fisherman for years and Marianne, worked for a fish buyer based in the Basque Country before they opened a successful fish and chip shop in Killybegs. After participating in Bord Bia/SuperValu’s Food Academy, and with help from Donegal and Leitrim LEOs, the product was developed. Preserved in olive oil, Shines Wild Irish Tuna is now stocked in 200 SuperValu stores nationwide. It is also sold in high-end independent shops including Avoca, Fallon & Byrne and Cavistons. The company also branched into new products and is hoping to export soon into the UK, the US and Russia.